Underfloor heating is economical and one of the least troublesome ways to provide heating at home (you will find more information and advice on underfloor heating and choosing the right cladding here. The whole space of walls and floors remains at our disposal. The rooms are also heated evenly, without the effect of overheating near the radiators and insufficient heating in areas away from them. Another “pro” argument is low air circulation and low amount of dust in the air in areas heated this way. Moreover, the underfloor heating system can act as a cooling system in summer. 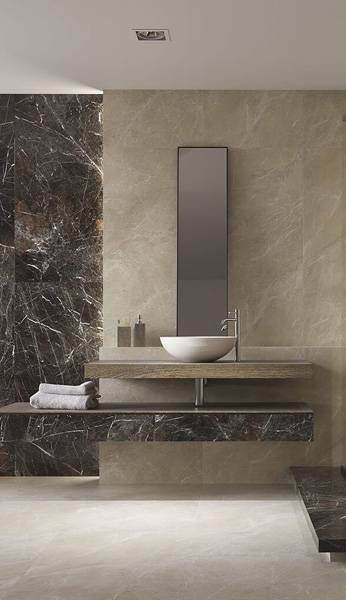 Stone and wood – a timeless combination of natural colours and textures allow creating a friendly, atmospheric bathroom. Lack of radiators on the walls provides more space and the heated floor inhibits the growth of microbes. Naturstone Collection, Ceramika Paradyż. In theory, almost every type of cladding will be suitable for use with underfloor heating. In practice, however, it is good to choose a solution that will be a good heat conductor and thus more cost-efficient. Ceramic tiles or stone will definitely be a better choice than a classic, thick parquet or padded carpet, which acts as effective heat insulators. This translates into a less efficient heating system, and consequently – to higher costs of its maintenance. In addition to the obvious economic factor associated with heat conduction, the durability of the cladding is also important. With the use of a suitable adhesive, temperature fluctuations have no impact on the longevity of ceramic tiles. Tiles do not deform, shrink nor emit any harmful substances under high temperature. Underfloor heating, installed under the surface of the whole house or apartment, provides comfortable condition throughout the whole year. Ceramic tiles with the appearance of natural wood perfectly conduct the heat and contribute to the design of modern space. Aveiro collection, Ceramika Paradyż. In modern construction, underfloor heating in the bathroom is usually a standard now. That is not surprising, considering it is the easiest way to ensure healthy conditions in this most humid part of the living space. Water, used in all wet hygienic practices, evaporates much faster thanks to the heated floor. Soft rugs near the shower and bathtub, are dry and ready to absorb the droplets of water whenever needed. Underfloor heating is also perfect for allergy sufferers as it reduces the amount of fungi, bacteria and mites on the floor surface. Cosy bathroom in a loft interior. Light ceramic boards are always dry thanks to discreet underfloor heating. Tammi collection, Ceramika Paradyż. Going barefoot through the whole house! Children do not like home slippers very much. Small feet prefer close contact with the ground and reliable stability of each step. Ceramic tiles, therefore, will be perfect for children’s room, because laid over the underfloor heating, they will never become unpleasantly cold. Hygiene is also an important factor for parents. Vacuuming and wet cleaning of floors are the daily chores of caring guardians. A ceramic floor that a heating system hidden under it does not absorb moisture, is resistant to cleaning agents and quickly dries after cleaning. Increased activity of children and their unrestrained desire to shuffle, throw and experiment with a variety of toys and equipment – is another argument for a durable ceramic cladding, resistant to abrasion and dents. During the short “transitional” period when the floor is cool, a light rug can be laid in the play area – thanks to it the kids will always be comfortable. Playing with toy blocks, reading, rolling, building, playing the shop and racing – it is all very pleasant when not happening on a cold floor. Adana collection, Ceramika Paradyż. Wood makes the interior cosier. However, natural wood is an insulator that reduces the effectiveness of underfloor heating. If you like wood – you can choose one of the ceramic tiles collections that perfectly imitates the look of your favourite type. A study in a loft apartment – rough and cosy at the same time. Large-format tiles imitating wood make the cool, industrial interior warmer. Tammi collection, Ceramika Paradyż. Ceramic “wood” is available in many types – from oak (and its various variants – natural, whitened or tinted), through walnut, to exotic wood. 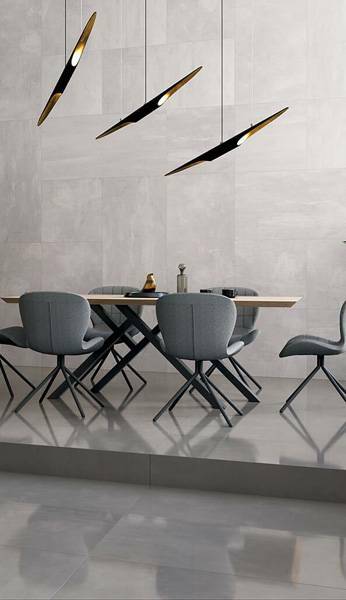 You can take into account many formats of ceramic “boards”, such as long and shorter tiles with different widths or squares combining many small parquet boards in one tile. Soft, pleasant to touch natural wood has the disadvantage of being prone to deformations – dents, scratches and abrasions. Ceramic wood is definitely more resistant to the destructive impact of everyday life. And – as we have already stated – it perfectly conducts heat, effectively cooperating with underfloor heating systems. The living room floor can be continued in the winter garden or on the terrace. Thanks to this you will spend much more time closer to the sun and nature. Roble collection, Ceramika Paradyż. 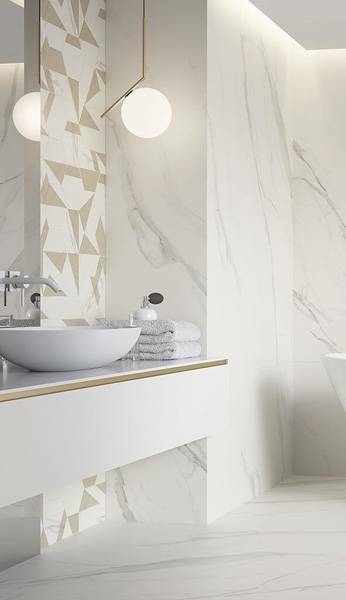 Natural stone is the inspiration base for countless ceramic collections. Modern advanced production technologies allow for imitating the rarest, most precious natural stones. Huge selection of colours, textures and formats opens up an unlimited arrangement potential. 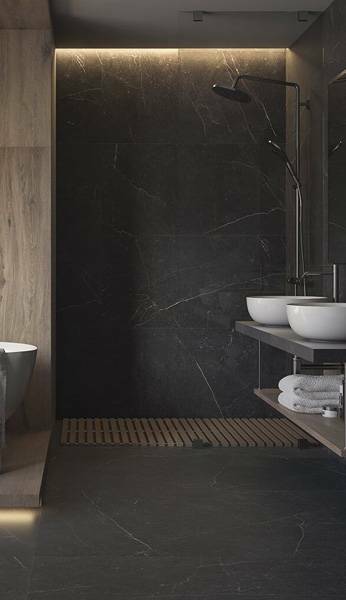 Although natural stone is as good a heat conductor as ceramics and works well with underfloor heating, it is subjectively significantly colder to touch during the months when the floor is not heated. It is good to take this factor into consideration (as well as the requirements for natural stone maintenance). The impressive shining ceramic floor is not only a decoration of the living room but also a heat carrier, effectively heating the spacious interior. Naturstone Collection, Ceramika Paradyż. It is nice to relax after work (and during work), on your own piece of beautiful, stone-imitating floor. Teakstone collection, Ceramika Paradyż. It is good to care about the functional aesthetics of the living space. Discreet, hidden from sight underfloor heating systems work efficiently, taking care of proper interior conditions throughout the whole year They provide heating or cooling, according to the needs of users. They are very cost-efficient when used with ceramic cladding, perfectly absorbing and giving heat to the environment. Thanks to its ease of maintenance and excellent durability, this solution is both comfortable and economical. What are the advantages of underfloor heating combined with ceramic tiles? Economical method of heating – the one-time cost of installing a underfloor heating system, pays off due to the high efficiency of daily use. Do you want more? Regularly visit our web page www.paradyz.com.